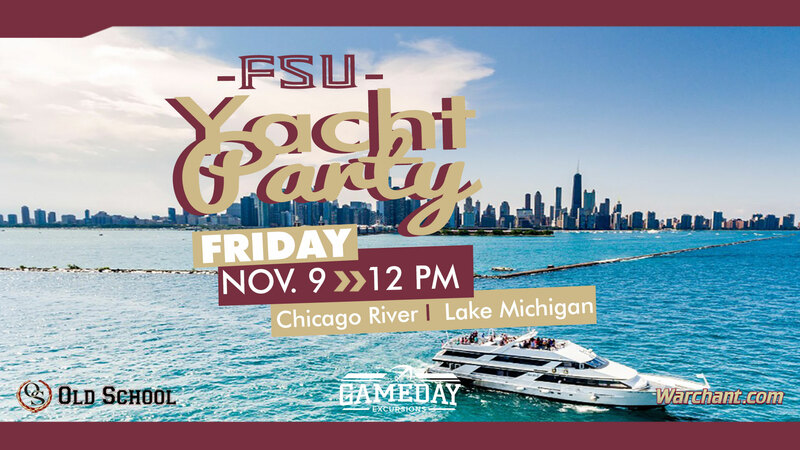 FRIDAY: YACHT PARTY - OPEN BAR, DAY PARTY 12pm-3:30pm w/ DJ - Chicago Skyline Lake Michigan + River Cruise. This is a party atmosphere meant for those younger souls. Yes, two floors are indoors (heated, if needed) top deck is open air to get that needed gram :) Directions to DuSable Harbor will be sent to all attendees via email! 2:30pm - 7:15pm: EXCLUSIVE TAILGATE PARTY w/Beer, Gameday Meal, Live entertainment, DJs and much more! - Transportation To and From Chicago (Division St. Bars) for FSU/Notre Dame in South Bend. - Notorious koozies, great jams, and FSU's finest! » Welcome Party @ Hopsmith Chicago welcome party FREE admission for Early Bird ticket buyers @ HOPSMITH Tavern. Live DJs, FSU giveaways, drink specials and more! 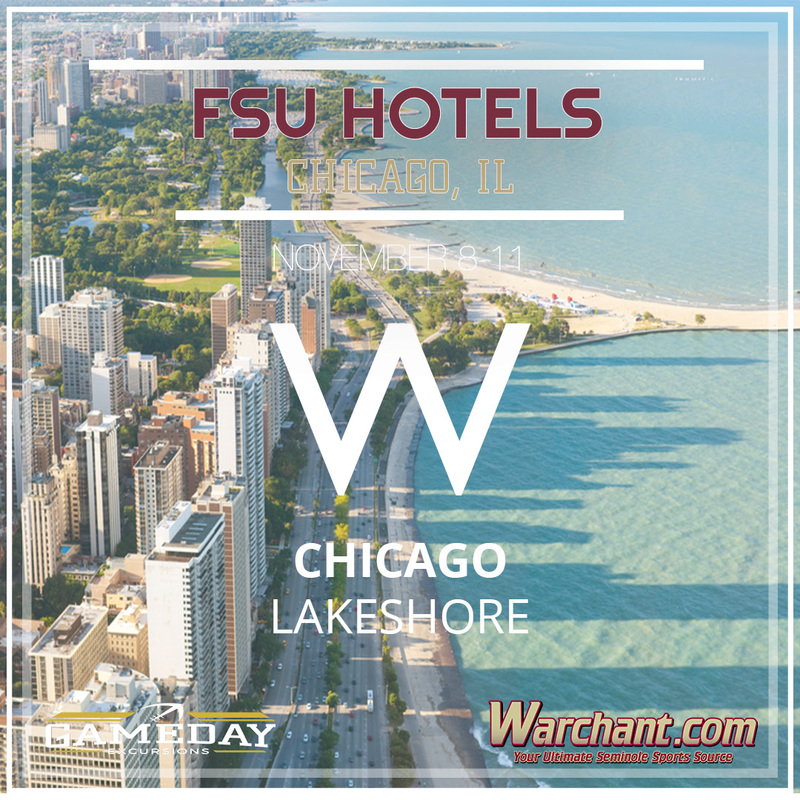 Gameday Excursions has secured a limited block of rooms at significant discounts in the prominent Lakeshore/Gold Coast area of Chicago. Due to multiple large conventions being in town + the Notre Dame game, we recommend booking by August 31, 2018 at the latest to guarantee availability. If one person buys tickets for the group, you will automatically be placed together on same bus. 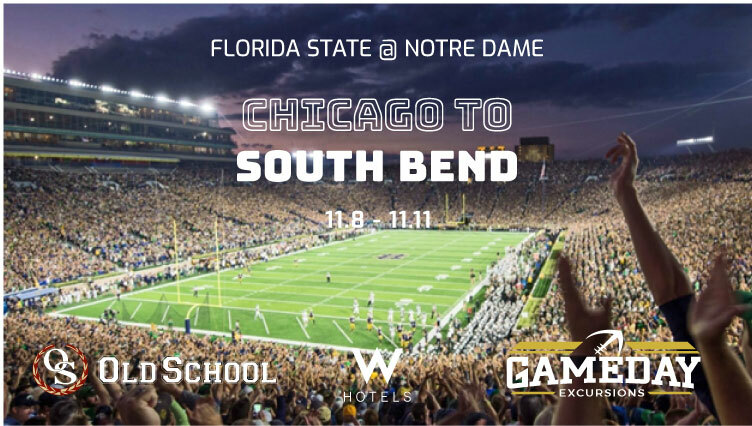 If multiple people buy tickets, please email invite@gamedayexcursions.com with the other ticket purchasers in your group and we will make sure you all are all together. UPDATE 10/30: Information overview will go out end of week with all event specifics out to attendees this weekend. UPDATE 5/14: Tickets to go live this week. UPDATE 2/8: 7:30pm kickoff announced - Noles under the lights! UPDATE 1/15: Look for an official launch May 2018. UPDATE 12/30: NBC to televise FSU @ Notre Dame! Chicago to South Bend 15 W. Division St.